Whimsical maverick Jack Clement — singer, producer, ringleader, writer of classic songs, discoverer of stars and member of the Country Music Hall of Fame — died this morning at his Nashville home. He was 82, and suffered from liver cancer. Known as “Cowboy Jack” in spite of his avowed dislike of horses and his propensity for wearing sneakers and Hawaiian shirts, Mr. Clement leaves a singular legacy. At Sun Records in Memphis, he was the first to record Jerry Lee Lewis and Roy Orbison. In Nashville, he brought Charley Pride to popular attention and desegregated country music in the process. Mr. Clement schooled studio protégés Garth Fundis, Allen Reynolds, Jim Rooney, Mark Howard and David Ferguson, men who who went on to work with Garth Brooks, Trisha Yearwood, John Hartford, Nanci Griffith, Crystal Gayle, John Prine, Iris DeMent and others. Mr. Clement wrote “Just Someone I Used to Know” for Porter Wagoner and Dolly Parton. He co-produced “Angel of Harlem” and “When Love Comes To Town” for international supergroup U2. What else? Loads. . .
My dear friend and mentor Cowboy Jack Clement died last Thursday at age 82. Cowboy was the first person I met in the music business. I could write a book, and actually have written some about him in my first two. Condolences to his main squeeze Aleene Jackson, his children Alison and Niles, and to all who knew and loved him. The night after Jack died, I made my debut on the Grand Ole Opry. It was like a dream … and something I never imagined would happen. Special thanks to Woody Paul Chrisman (Riders in the Sky) for introducing me and to Boo Ray and Matraca Berg for lending their voices on “Let’s All Help the Cowboy Sing the Blues,” which we sang at the last minute to commemorate The Cowboy. To stand in that little circle of wood where Elvis, Hank Williams, Johnny Cash and so many of my heroes have stood … was an honor beyond words. . . This entry was posted in Country News and tagged Allen Reynolds, Buzz Busby, Cowboy Jack Clement, Crystal Gayle, Dolly Parton, Hayloft Jamboree, Jim Rooney, Marshall Chapman, Porter Wagoner, Scotty Stoneman. Bookmark the permalink. Cowboy entered my life in April of ’76 when I played him a song, “Only The Best,” I had recorded in Massachusetts, thanks to the backing of David Gessner. Everett Alan Lilly, Tennis Lilly, Kenny Kosek and Larry Feldman were among the pickers. 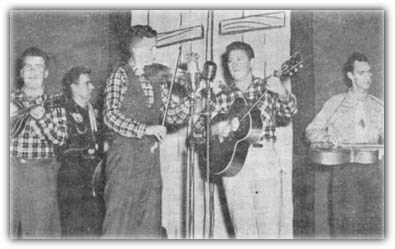 Jack had played in Boston on the Hayloft Jamboree with Buzz Busby and Scotty Stoneman in 1953 before he was at Sun Records, so I didn’t have to explain to him about the country music scene in Boston. In addition to liking the song—he loved waltzes—he liked the fact that I had an M.A. from Harvard in Classics and that I played the guitar upside-down and backwards. He liked odd people, and I definitely qualified. Jack gave me and countless others many opportunities and was the most generous person I’ve ever known. Talking to two of those people last night, Allen Reynolds and David Ferguson, they both compared Jack’s final days to the bringing down of a fader on a mix. And what a mix it was! What a life! Beautiful, Jim. Love that fader image.